Deveneys of Dundrum: Williams Deal - January 2011. Williams Deal - January 2011. I've never been the sort to use January as a means of detox. January is by far the most depressing and uneventful month of the year͵ hence the need to consume quantities of good alcohol. I am not͵ by any means suggesting vast quantities but a liquid sedative in the disguise of a good bottle of beer͵ a nice short of whiskey or a glass of decent wine is necessity. Williams Brewery will all be available on a mix 4 bottles͵ for a mere €10. 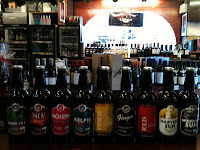 The range currently consists of 9 varieties͵ all displayed in photo attached and all available in Dundrum. Let's start this January revolution! !